The mother of murdered teen Gilad Sha'ar confronted top security officials, pleading for answers about how the system failed her son. An angry Bat-Galim Sha'ar, mother of Gilad (16), who along with Eyal Yifrah (19) and Naftali Frenkel (16) was kidnapped and murdered by Hamas terrorists, on Wednesday leveled harsh criticism at top security officials. 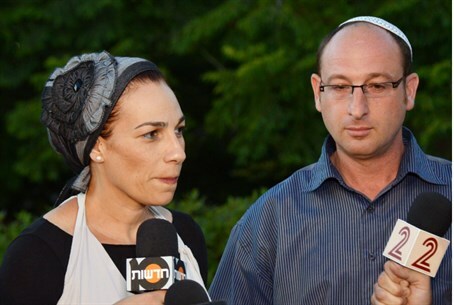 Speaking to Arutz Sheva, Sha'ar promised the two officials that after her son came home, she would “go after them” and the security apparatus in general for waiting for over eight hours before opening an investigation into the teens' disappearance. Sha'ar made the comments after the recording was released of the chilling call Gilad made as he was being abducted to the police emergency call center tape. The call, which took place at 10:25 p.m. on June 12, lasted in total for 2:09 minutes - most of which was comprised of the police trying to resume contact after the caller was abruptly cut off. Some of the tape consists of garbled pleas by Gilad for help, with the police respondent saying “hello?” in response, apparently not understanding what is being said to him. Eventually he does get the message and asks the youth where he is, but at that point, Gilad is cut off. In the background, various noises are heard including shouts by the kidnappers at the youths to “keep their heads down,” an Israel Radio program, and several gunshots – and, it was revealed Wednesday afternoon, singing by the terrorists. Police apparently thought that the call was a hoax,, and ignored it until the parents of one of the youths filed a missing person's report at 3:00 a.m. It was still several hours before police connected the frantic call with the report. Bat-Galim Sha'ar heard the tape the day after the call was made, and noticed the gunshots too – and was told by police, she said, that they were “blanks,” and that her son was probably still alive. "We all were hopeful, we heard Gilad's voice on the tape and it did not sound like he was about to be murdered," she said. Police say that it is possible that the youths were killed just minutes after they were abducted, after the terrorists discovered that the phone call had been made. Gilad's father, Ofir, who called dozens of security organizations and emergency hotlines during the fateful night his son went missing, is very frustrated. Police announced Sunday that the Judea and Samaria District Operations Department Commander is to be dismissed as a result of the police mishandling of the call, as will the Commander of the District's Control Outpost (Mashlat) and Operations Branch Commander, IDF Radio reported Monday. Also to be dismissed are the policeman who was in charge of the shift at the police's '100' hotline and the senior policewoman who received the information about the call and classified it as a prank. Speaking to Channel 10 Tuesday night, Bat-Galim Sha'ar said that “because there were many departments and offices involved in dealing with the initial reports and the phone call, no one is willing to take responsibility." "At some point that night we realized that it was no longer a police matter, but an issue for the army, which took some time to figure out what was going on – and there first move was to set up roadblocks in the Beit Shemesh area, wasting valuable time. Finally we decided we needed someone with 'connections' to get the search started," said Sha'ar.